If these bones could talk, what stories we would hear! 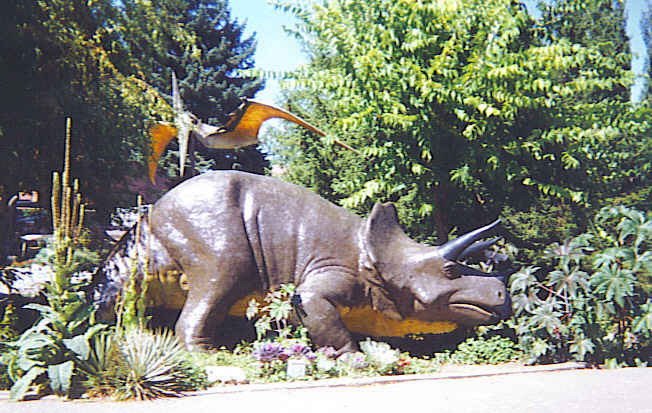 Take a trip back in time and explore the Dinosaur Gardens in Vernal, Utah to see life size replicas of dinosaurs as they used to roam this region; then head to the quarry to see some fossilized dinosaur bones. These unusual gardens and a wonderful museum are part of the Utah Field House of Natural History State Park. Inside you will find real fossil skeletons, a Fossil Lab plus an interesting film, while outside the beautiful dinosaur replicas along the garden path give you a great size comparison. It is like visiting a prehistoric zoo! One of my favorites was the Brontosaurus, now also called Apatosaurus due to a scientific battle. This long necked, plant eater just seemed a peaceful animal in spite of its size. Often 70 foot long, “Thunder Lizard” weighed up to 30 tons. Being the symbol of Sinclair Oil, it is one of the most familiar dinosaur images. Triceratops was the most famous horned dinosaur as its fossils are found in greater numbers than any of the others. Even though they looked quite fierce and were very successful in battle, Triceratops were plant eaters. Their strong jaws made it possible to grind up vegetation, probably including small flowering shrubs. Triceratops was about twice the size of a rhinoceros, with four short legs and three horns on its face. People often find it difficult to fathom that this creature lived approximately 65 million years ago. As we head North from Vernal, we pass movable sprinkler irrigation systems as we glimpse our first view of Dinosaur National Monument in the distance. Early settlers developed an irrigation system, which is assisted by Flaming Gorge Dam today, to provide water to the developed farming area. Before irrigation and the building of dams, this area was a barren cactus flat and not considered a desirable place for settlement. 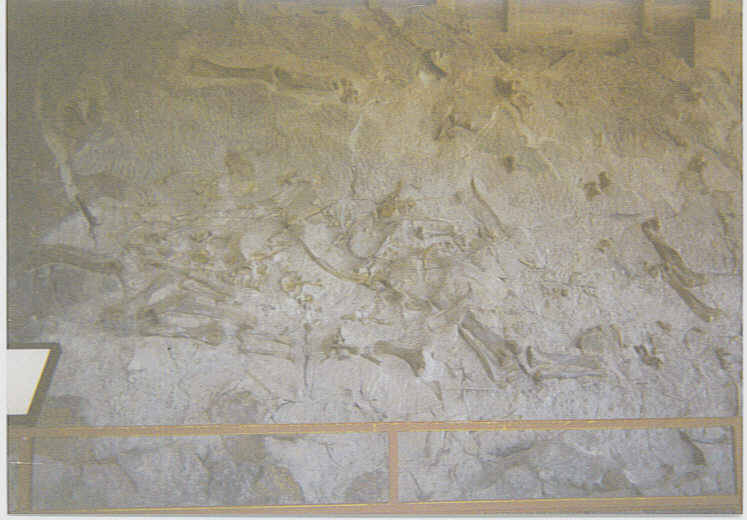 Upon arrival at Dinosaur National Monument, you find a large quarry of dinosaur remains in an exposed sandstone wall. The actual Quarry Visitor Center is in Utah, while most of the Dinosaur National Monument extends into bordering Colorado. Discovered in 1909 while searching for fossils for Carnegie Museum, this area is thought to be the best in the world for obtaining information concerning late-Jurassic-period dinosaurs. It would appear the dinosaur carcasses were washed down the Green and Yampa Rivers, then caught on the sandbars, which eventually turned to rock. After all these years, there still seems to be no end to what can be found buried in this rock face. At the present time, The Quarry Visitor Center is being rebuilt due to structural problems with the original building, and expected to reopen in the Fall of 2011. In the meantime, you can walk the Fossil Discovery Hiking Trail to see dinosaur fossils in the cliff face – as long as the temperature is below 95. The trail is actually closed for safety from heat related problems when it exceeds that temperature. 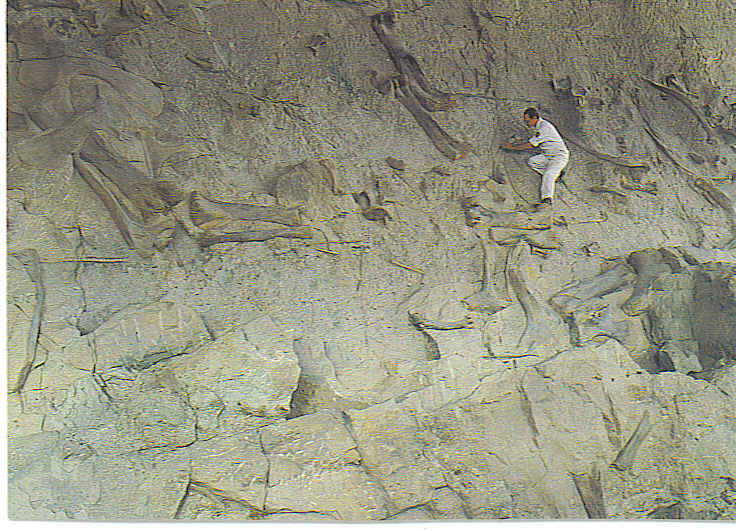 When there several years ago, it was amazing to see the vast amount of fossils naturally exposed in such a small area. Enjoyed watching the paleontologists at work on the sandstone surface, carefully chiseling away the sandstone from the fossilized bones. Stop back after October, 2011 to see the new Quarry Visitor Center. An interesting place to visit, but would be more exciting to be part of the dig, and chisel bones from the wall…very carefully. Maybe you could discover something yet unknown! Looks like an amazing place! The boys would love it I am sure. Daily something is coming up suggesting I check out that part of the country. Utah is my favorite state as I always enjoy the beauty of the red rocks and hoo-doo’s. Hopefully you will get to make a trip there sometime soon. Since my trip there, I have become more interested in the ancient history of our United States. People and animals have been around here for thousands of years. Keep exploring and thanks for checking out my Gypsy Road Trip.